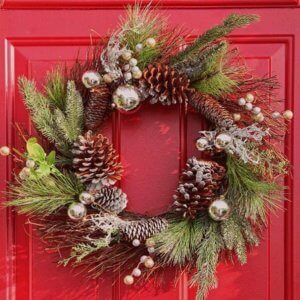 The most wonderful time of the year for those who are lucky enough to have an eye and passion for red interior styles! Red is the colour of strong emotion and powerful energy, stimulating conversation and our emotional awareness, it’s no wonder this colour is especially suitable for sociable areas like the kitchen and dining room. Our kitchen is undoubtedly the most important room in the house, where we do most of our living and establish lots of fond memories with our family so it’s only natural we choose colours that evoke a warm and friendly atmosphere. The colour Red in the kitchen is a daring and bold design choice that can impact positively on our eating habits, think ripe tomatoes, cherries, peppers and apples etc. It is a brilliant choice for the kitchen. 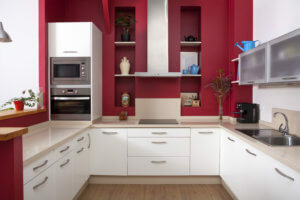 Red can be incorporated into this area via splashback, shelving, cabinetry and your utensils. ‘Celebration Day’ is an exquisite purple based red that sits perfectly alongside the white and neutral countertops and units, keeping the look light and airy. The wooden flooring keeps this palette grounded and balanced. A strong and visually striking red that has a deliciously bold and sultry appearance. It can hold its place well as a solo colour along with navy, teal and gold accents. When used in small and intimate spaces ‘Smithsonian’ creates a cocooning atmosphere. These red sits elegantly in bedrooms, living rooms and dining rooms along with walnut and dark wooden pieces. The VIP area in the home aka the bathroom is the area where our very own spa like oasis can be created and where we can experiment with colour! Not a dynamic or vibrant red but part of the red family, ‘Romance’ is a dusty blush that evokes a quiet and understated sense of style. For vintage style enthusiasts ‘Romance’ is your go-to red for a 1950’s/retro feel. The contrast of dark brown cabinets against the pink highlights ‘Romance’ as an elegant and graceful shade of red. Colour is used quite often as an expression of who we are, we see it in fashion&beauty, interiors, art and in our exterior colour scheme. The colour we choose to show to the outside world says we are not afraid to be bold. To be different, to stand out from the crowd! For many of us, we love the colour Red on our front doors. In Irish folklore, a red front door is said to ward off any evil spirits and ghosts. ‘Signal Red’ is a poppy and punchy glossy red that gives extreme kerb appeal to your façade. It’s a welcoming and fun shade that shines bright like a diamond all the year through!